The RCMS460 series provides ground-fault monitoring for up to twelve separate systems or channels in grounded and high-resistance grounded, AC/DC, single-phase or three-phase systems. The RCMS460 is also compatible with systems that contain power conversion equipment, such as variable frequency drives. Two configurable Form-C (SPDT) outputs trigger on alarm activation. 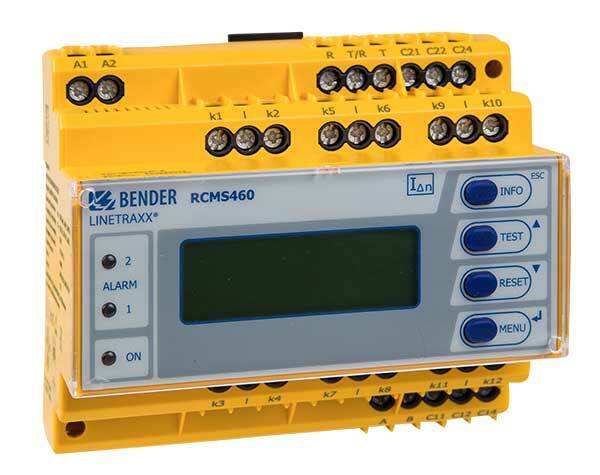 The RCMS460 is compatible with Bender's communication gateways for connecting to Ethernet and Modbus networks.